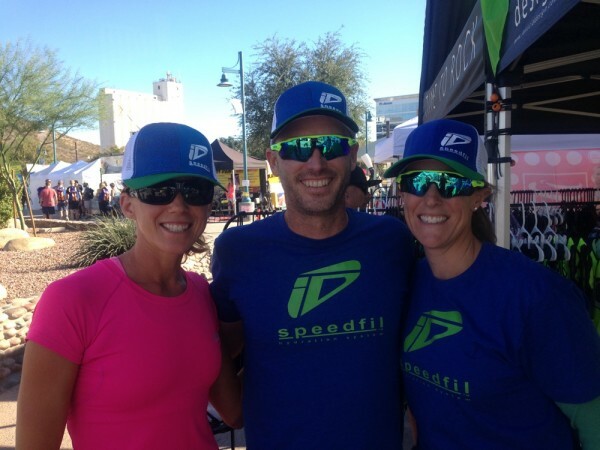 My race at IM Arizona had an unexpected outcome and I did not finish the race. A DNF at a race never feels good, however, I know it was the right call for me on race day. Now it’s time to recover and regroup from what was a long season that was filled with lots of ups and downs. 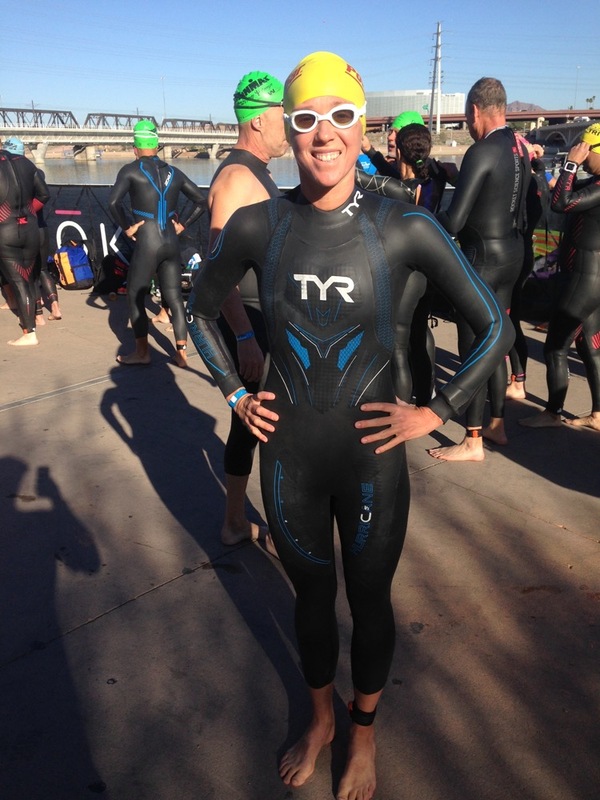 Moving forward, I am going to take away what I learned at IM Arizona. I will also remember the highs of the season and reflect on the five wins I did have this season. You learn much, much more from a race that did not go as planned than from a win and this weekend was a huge learning curve. Nate and I arrived in Arizona four days prior to the race. Traveling from FL took almost a full day of travel and I also wanted time to check out the race course. Pre race preparation for an IM requires so much planning and organization. It took half a day organizing my five gear bags, race nutrition and planning out a routine for race morning. The weather in AZ was much cooler than we expected. In the days prior to the race, the temperatures were in the low 50s, but the bright sunshine warmed up the day to nearly 80 degrees by mid afternoon. This was so much different than FL, but felt nice. I did the race prep swim and was surprised how cold I felt. I made the decision to wear the TYR neoprene scull cap under my cap since I had an ice cream head ache in the short 10 min warm-up swim. It has been so long since I have swam in cold water. I was practicing in my wetsuit in FL in 78 degree water, so 63 degrees felt quite brisk! Race day was expected to be cold and rainy, so I knew I needed to prepare. Prior to the race, my goal was to conserve as much energy as possible. I layered up my clothes and focused on staying warm. Just before the swim start, Nate dumped hot water down my wetsuit, which felt amazing! We started the swim 5 min after the men at 6:45am. Due to a cloudy morning, it was still dark. I switched to the TYR Special Ops2 goggles for this race. I found the other goggles I had previously been wearing would fog durning my swims and I had trouble scouting the buoys. The googles worked well in the clouds and in the sun! Like most long distance races, I was amazed how fast some women took out the first 200 meters. Several minutes into the race, I was in second position and stayed there the entire race. 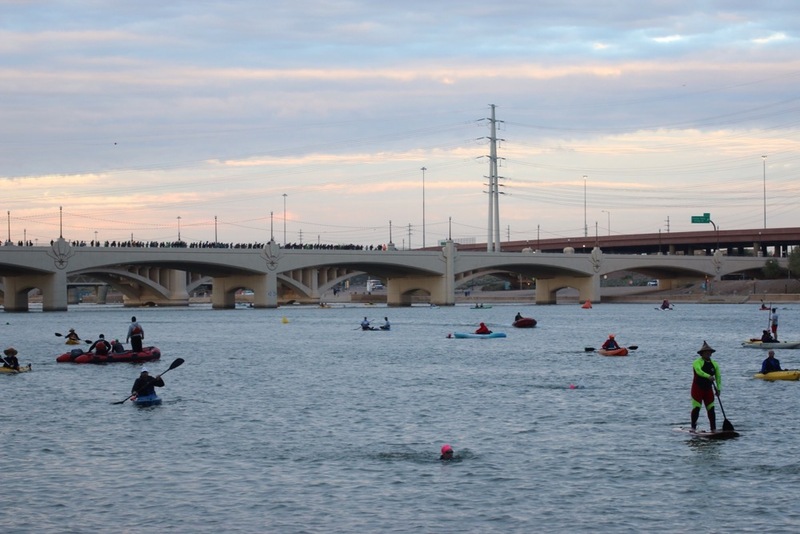 I was on Meredith’s feet and she had completed this race 12 times before and navigated great lines swimming down Tempe town lake. I excited the water four seconds behind her in 48:29. The swim did feel much longer than what I am used to, but I felt relaxed and in control throughout the swim. I was surprised how numb my feet were exiting the water. It’s never fun to try and run fast on numb, cold feet…it’s painful. This was my first time experiencing the bag pickup and change tent. It was a quick and smooth transition and just as fast as a short course transition! Right before I exited the water, I swam past a group of men, so when I started the bike, I had several men pass me right away. 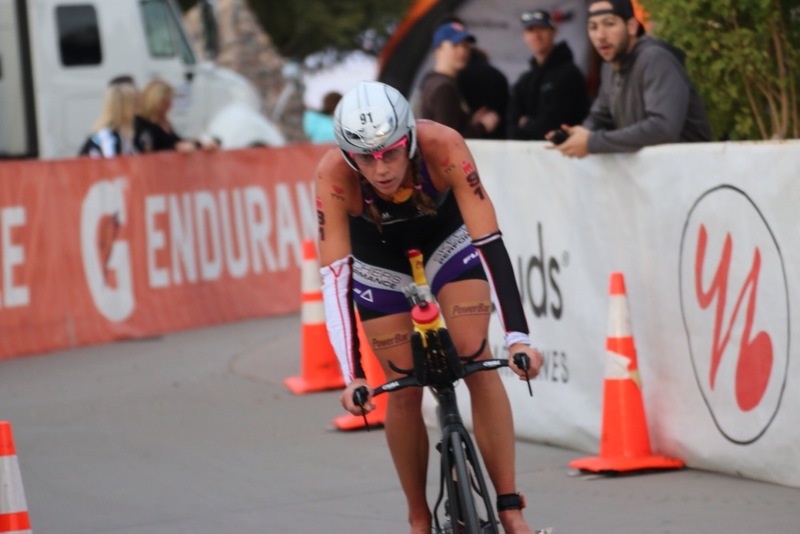 Meredith was up the road just ten seconds or so, but did not want to go much over my goal watts for the race….I did not want to make the mistake of taking the first ten miles out too hard! As I was approaching the end of the first lap, I was five watts over my overall goal watts, although I expected that average to drop to my goal watts by the end of the 112 miles. The way out was windy and slightly uphill and the second half of the loop was fast. As I got close into town, I noticed my front wheel was flat. I fixed it and got back on my bike only to shortly find a couple of miles later it went flat again. I happened to flat right next to police officers who called in neutral support. Twelve minutes later, I was back on my bike and in a bit of shock. This was the first time in my eleven year career I have been held up by flats….so I guess I should consider myself lucky. It was really hard mentally to get back into it, but I told myself to keep going. Over the next 15 minutes, I was starting to feel better, but then at mile 49 and again at mile 45 I had to pee. Shortly after that, my muscles just did not want to move anymore. I don’t know if I was mentally defeated, physically defeated or both. After talking with Nate he believes my core dropped significantly while on the side of the road (body not used to 55 degrees as I was training last week in 95 degrees). I am so used to drinking a lot of fluid right away on the bike, I did what I was used to. With too much fluid in my body and my core dropping from the stop, my body got rid of all the fluid…and all my electrolytes. At that moment I decided this was not going to be my first Ironman finish. Not my day. I stopped and talked with Nate and we called it a day. Better to start recovering now for next time than to push through after the adversity. For many people, finishing the IM is what many athletes live for and I deeply respect that. I was here to attempt to earn points, gain experience and be in a position to race, but not put myself in a position where I was simply going through the motions. 1). Become a better bike mechanic! 2) Train in a similar climate where you will be competing in your IM for an extended period of time! 3). In a cold race IM nutrition is very different verses a hot race. My body has been training and racing in heat and humidity for the last three years. Once in the last three years, I raced a cold Olympic distance race, but it’s much easier to transition to a different climate for shorter races. 4). When you have general fatigue from a long season, it will catch up to you in a long race. A short distance race you can fight through, but you have to be very smart heading into an IM. Congrats to Meredith on her incredible win! 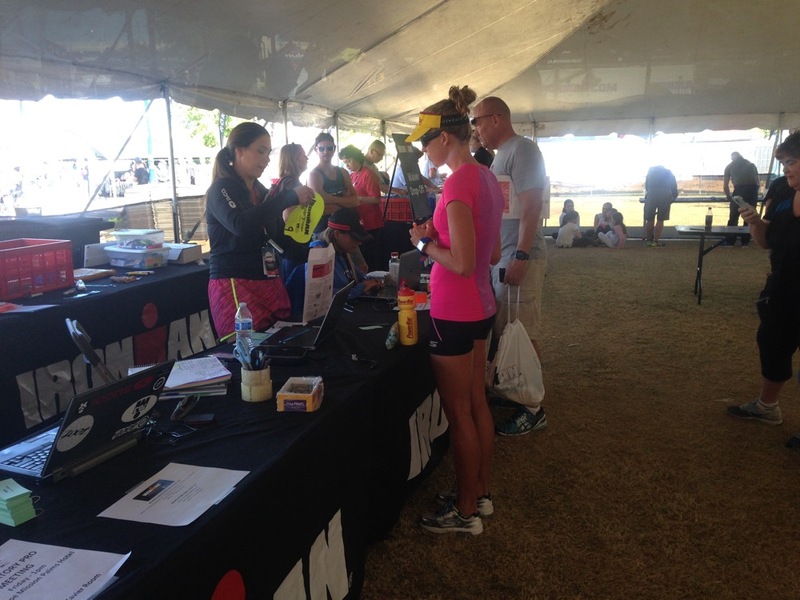 Also congrats to all those who became an Ironman for the first time and those who added another to their resume. I am looking forward to spending some down time with my family. I am excited to be full time Mommy during this off season and gear up for next season. Thank you so much to all the support from my family and friends. Thanks to all my sponsors this 2015 year and being patient as I have made this transition to long course. I learned a great deal from this first IM experience and looking forward to racing again in 2016 (which will be here before I know it). Thank you to all the training buddies here in Clermont, those who keep my body tuned up and in check and of course thanks to my husband/coach, Nate. Many reason to give thanks in this Thanksgiving season and always. Happy Holidays!